About 1 in 9 women in the US experience symptoms of postpartum depression. Expectant mothers look forward to bonding with their baby. They anticipate welcoming a new life into their family and making many happy memories. However, this isn’t always the case. Feeling down and blue after the birth of a child is a heartbreaking experience, and unfortunately many moms experience postpartum depression. If this sounds like you, please know that when searching for a solution, it’s important to be careful about the type of treatment you choose for help. This week, the U.S. Food and Drug Administration (FDA) announced in a news release that it approved the first drug for postpartum depression. The drug is Zulresso (brexanolone), an injection for intravenous (IV) use for the treatment of postpartum depression in adult women. While many women may be excited about this news, we are here to tell you that drugs are not the answer. They do not solve the underlying cause of your symptoms and come with negative side effects. Read on to learn about the warnings on this new drug. Remember, drugs are toxins that have to be detoxified by your liver. The good news is that there is a safe, natural solution. 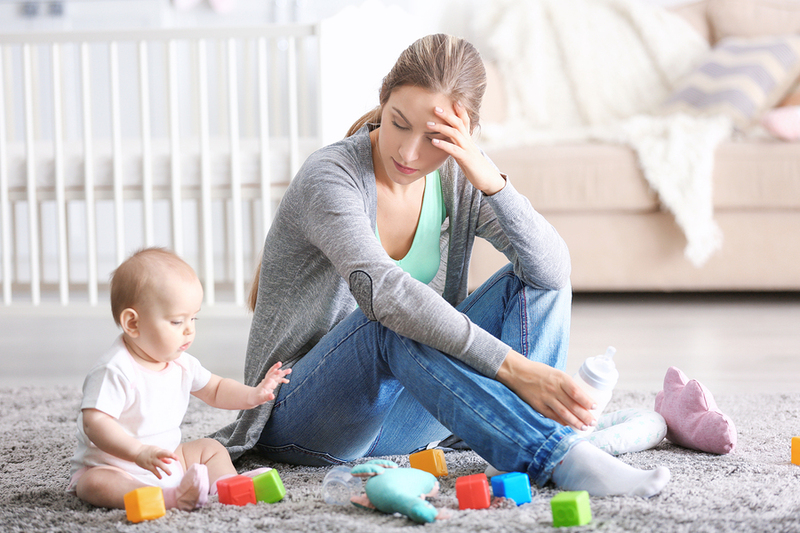 Postpartum depression, also known as the baby blues, can occur after childbirth and causes a woman to feel sad, anxious, and tired, among many other symptoms. It’s important to understand what happens to your hormones after childbirth so that you can learn the importance of restoring your hormones back to normal. Upon the birth of the baby, the placenta is expelled resulting in an immediate drop in a woman’s progesterone level. Meanwhile, estrogen levels remain high, creating a hormonal imbalance. Oftentimes, this imbalance in progesterone and estrogen, referred to as estrogen dominance, does not normalize after childbirth, and causes postpartum depression. The symptoms of estrogen dominance, or low progesterone, can be weight gain or mood-related symptoms such as anxiety, panic attacks and depression. Estrogen dominance also leads to hypothyroidism, which causes fatigue. Treating depression lies in treating the underlying cause, which is often a decline in your hormones. Conventional doctors typically prescribe antidepressants for postpartum depression, however women don’t have postpartum depression because they are low in antidepressants. These drugs are addicting with many negative side effects, including more depression, and suicidal and homicidal behavior. Before you consider taking antidepressants, please do yourself a favor and get evaluated for hormone imbalance first. Zulresso is administered as a continuous IV infusion over a total of 60 hours (2.5 days). Patients must be monitored for excessive sedation and sudden loss of consciousness and have continuous monitoring of oxygen levels in the blood. While receiving the infusion, patients must be accompanied during interactions with their child(ren). The need for these steps is addressed in a Boxed Warning in the drug’s prescribing information. Patients will be counseled on the risks of Zulresso treatment and instructed that they must be monitored for these effects at a health care facility for the entire 60 hours of infusion. Patients should not drive, operate machinery, or do other dangerous activities until feelings of sleepiness from the treatment have completely gone away. Since the drastic drop in progesterone causes the low moods of postpartum depression, it only makes sense to restore the body’s progesterone levels back to normal. Bioidentical progesterone is identical to the progesterone made by your body. By replacing what is missing and balancing your hormones, you can resolve your postpartum symptoms and feel like yourself again. More importantly, you can be the best mom you can be and enjoy being with your child! Are you experiencing symptoms of postpartum depression or hormone decline? Take our symptom checker to help identify what symptoms you are experiencing and the possible underlying cause. If you experience any of the symptoms of postpartum depression, don’t ignore your feelings. Be sure to reach out for help and support, and know that there is a solution. You can get the right help and feel like yourself again.